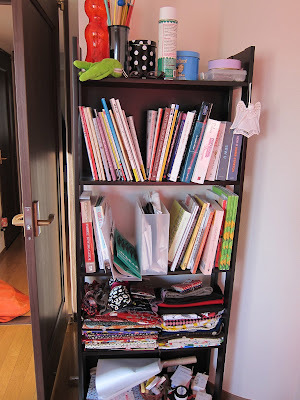 Google Thewallinna and other creatures: New sewing room - finally! Dear fellow bloggers and people who love to sew! Let me introduce me brand new sewing room. Happy happy happy happy! For the last two years this room was prison and my sewing space. Never again I want to see this photo! It reminds me of the hell on Earth and back pain. The room shines of all colors. People who know me won't be surprised. All my wardrobe consists of bright colors (besides 2 black dresses and 3 black t-shirts). Doesn't the room looks like an IKEA showroom? In Japan, IKEA is my second home since most of the interior design and furniture shops are overpriced. On the other hand, we have no plans to retire in Japan. Maybe couple more years, and we'll go to a new country. I love this funky table top. Because the top is not attached to the shelves, and I can easily move it when drawing patterns. And, No, it does not move when I sew. Happy happy happy :) My neighbors must be nuts with me jumping around. But, man, I am happy! My joy is obvious but probably difficult to understand for somebody who never had problems with sewing space. I spend so much time in the room that if a bed could fit, I would live here. Few hours after work are not enough to deal with all my projects: sewing, drafting patterns, ironing, working on sashiko etc. Besides, in two weeks I am heading to the sunny Israel and need to finish couple of frocks for the city of fashionistas! New sewing room looks great, with organized facilities as well as the natural light from the big window! It looks somewhat similar to my mother's sewing space in an old Japanese house of my childhood, both make me expect something good is on the way. Anjin Cafe is amazing! We should organize a crafty meet-up there! content offers. nearly online stores score consumer reviews early. your Youtube videos. They may smell same you are hunt for. Cheap Jordans Shoes Cheap Jordans For Sale on the electro-acoustic transducer. box alternatively of communications protocol.